Trees enhance the look and feel of any commercial or residential property, but like any other living thing, they need to be kept healthy. Diseases and insect infestation can cause irreversible damage to trees if not caught in time. Porter Tree Services tree treatment programs help keep your trees healthy and vibrant. The tree treatment programs and other tree maintenance services feature regular visits from our team of technicians. They will inspect the trees on your property to determine if any damage has occurred from insects or disease. While some aspects of physical damage are observable, others can only be assessed by a trained eye. When in the first stages of damage, trees can often be treated and the damage corrected. Trees that do show damage from disease or insects can be treated with sprays or by tree injections. Tree injection is a method where the chemicals we use to deter the insects and disease are injected directly into the tree. 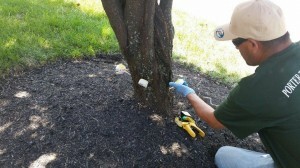 This method is the most advantageous for the tree and for others as it limits chemical exposure to surrounding areas. Besides monitoring the trees for disease and insect damage, our tree treatment programs includes applications of fertilizer. We apply fertilizer directly to the root zone, using a method known as “deep root fertilization”. These applications usually take place in the spring and the fall for maximum effect. 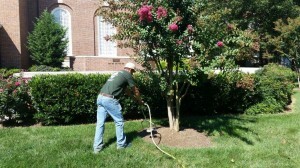 The tree treatment services at Porter Tree Services are based on years of professional experience. Our employees take pride in their knowledge of tree preservation and in their ability to communicate that knowledge confidently and considerately to our customers. We welcome the opportunity to answer your questions and to dialogue regarding your tree care needs. Keep the trees on your property healthy and strong with tree treatment by the professionals at Porter Tree Services. Contact us today and we can arrange a site visit. Call 410-882-TREE (8733).